Mainland senior kicker Sean Carey, a cancer survivor, made a 41-yard field goal with 0:01 on the clock to lift the Mustangs to a recent 24-21 win over Ocean City. Sean Carey trotted on the turf, the wind at his back, the rain in his face, the magnitude of the moment clear in his mind. The whole thing — the stakes, the scene, the circumstances — was something out of a kicker's dream. And Carey is a kicker. The score was tied. The game was down to the final seconds. That was Mainland's archrival, Ocean City, across the field. The division title was on the line. And so was a berth in the state tournament. "It's something you always dream about," Carey, 17, said. "But you never actually think it's going to happen." The same might be said of Carey's career. Doctors told him soon after discovering a rare form of cancer in his hip in the spring of 2015 that he likely would never play football again. That summer, he had surgery in which part of his hip was removed. He underwent seven rounds of chemotherapy before the procedure and seven more afterward. His weight dropped from 135 pounds to 107. His hair fell out. He called himself "the skinny, bald kid" when he entered Mainland as a freshman. He spent some of that school year at home since he was too weak, tired and prone to infection to handle the hallways. Carey underwent surgery for Ewing sarcoma, a rare form of bone cancer, in the summer before his freshman year. "First time I met him, he was completely bald," Mainland coach Chuck Smith said. "But he always just wanted to be part of it. He never felt sorry for himself. He's a kid who has always put the team first. It's never been about himself." Carey was a soccer player in his younger days but took up football in sixth grade. He showed great promise as a kicker and began working with local guru Jim Cooper. By eighth grade, Carey was dreaming of kicking for Penn State. But he also had some lingering stiffness in his right hip, a condition that seemed related to an inflamed muscle or some sort of joint issue. "I took a trip to Penn State, and I was so stiff I could barely walk," Carey said. An MRI exam revealed the problem: Carey had Ewing sarcoma, a rare bone cancer. "The doctors said I could have radiation or surgery," Carey said. "I went for surgery because that would give me the best chance to play again." Carey is 6-for-6 in field goals and 20-for-20 in extra points this season. That seemed far-fetched during his freshman year. And even as a sophomore, Carey wasn't strong enough to compete at the varsity level. But he kept working out. He underwent physical therapy. His health improved. His prognosis is good, and he needs to see doctors at Children's Hospital just twice a year. Carey was a member of the Mustangs' 5:30 a.m. weight-lifting club, which met three days a week from December through June. "I didn't think a person could be that strong," Mainland senior lineman Hector Guerrero said of Carey's determination to come back from his illness. Carey was a good kicker as a junior. He's been much more than that as a senior. 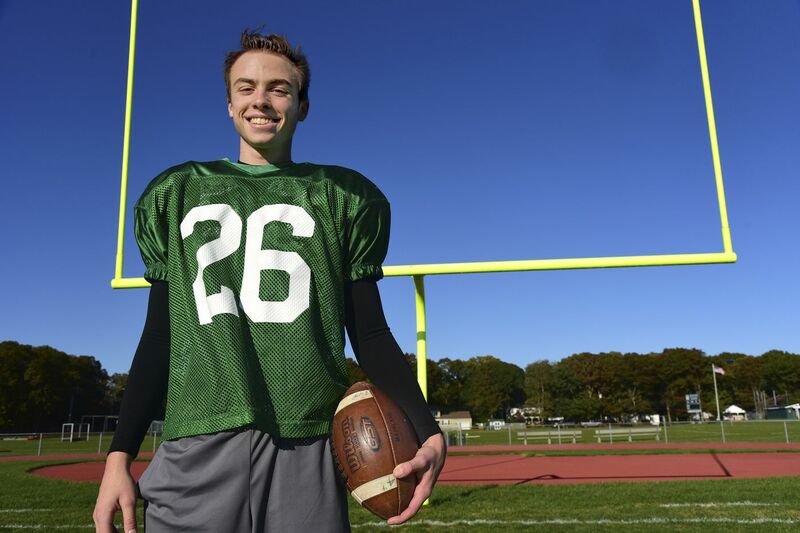 "I think he's the best kicker in South Jersey this year," Smith said. Friday night's game was loaded with importance, as visiting Mainland and Ocean City were both angling for a share of the WJFL Independence title as well as a berth in their respective state group tournaments. "This was a game we had circled on our calendar from the first day of the season," Carey said. Guerrero said he and Carey had the game in their minds long before that. "When we were freshmen and he was going through treatment, we used to talk about it, 'Game-winning kick to beat Ocean City our senior year,' " Guerrero said. "It was like the stars aligned." It was some game, with Ocean City driving the length of the field in the face of the wind coming off the nearby boardwalk to tie the score at 21 with a touchdown pass and two-point conversion with 1 minute, 8 seconds to play. Back came Mainland, driving down the field, putting Carey in position to decide the game. "I started to get loose when [Ocean City] scored," Carey said. "I thought it might come down to me." It was a storybook scene. Carey trotted onto the field with the wind gusting, the rain falling, the Mustangs aligning for a 41-yard try. For the season, Carey was 5-for-5 in field-goal attempts. He scored the only points in a 3-0 win over Oakcrest. He was 20-for-20 in extra points, too. This was a 41-yarder, on a windy, rainy night, with fewer than 10 seconds on the clock in the team's biggest game of the season. "What a moment," Smith said. "The wind and rain, so much on the line, our biggest rival, the last seconds of the game." The snap was good. The hold was good. The kick was even better, splitting the uprights with 0:01 showing on the clock. "He rocked it," Smith said. "He made it with 10 yards to spare." Carey had made the kick plenty of times in the past. But only in his dreams. "You think about kicks like that. You dream about getting that chance," Carey said. "But for it to really happen, it was just amazing." The setting: This is a first-round game of the South Jersey Group 4 tournament. The seeds: Shawnee (2-6) is the No. 4 seed. Mainland (6-2) is the No. 5 seed. At stake: The winner advances to meet the winner of the game between No. 1 seed Millville and No. 8 seed Winslow Township in the sectional semifinals. Mainland player to watch: Senior quarterback Dean Hall (289 passing yards, five touchdowns; 257 rushing yards, two touchdowns) is a top run-pass threat. Shawnee players to watch: Senior wide receiver Jon Searcy (29 catches, 406 yards, four touchowns); senior defensive back Joey Moore (59 tackles); senior all-purpose Joe Dalsey (810 passing yards, six touchdowns, 227 rushing yards, eight touchdowns.